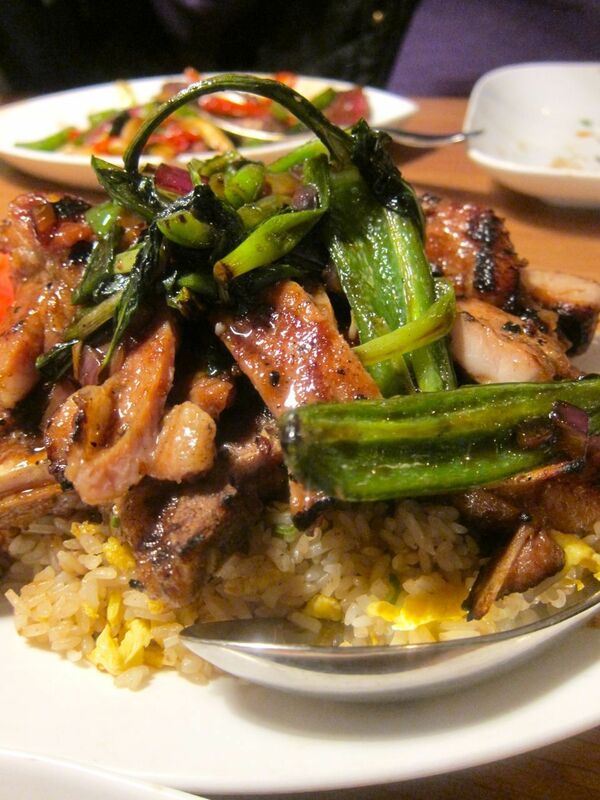 A Red Farm zealot singles out the lemongrass grilled pork chops as uptown’s triumph. Red Farm UWS finally, finally, finally opened for dinner last Thursday. Upper West Siders had willingly trekked to the Village, enduring the torture of navigating its no reservation policy to wallow in glorious inauthentic Chinese food and dazzling dim sum. Now they were antsy. We traded intelligence: The sign is up. The butcher paper is down. The plants are hanging. The Broadway space is a fresh version of downtown’s quaint townhouse charm. A series of unforeseen calamities struck in the walls and exhaust stack. (Well yes, all calamities are unforeseen.) The uptown Red Farm seemed to be taking longer than Spider-Man to get to Broadway. Then at last, a month ago, it opened for lunch -- a fresh luncheonette-look inspired by the ancient little duplex downtown but bigger, with 79 seats plus 15 stools at the bar. Prices have crept up a bit. 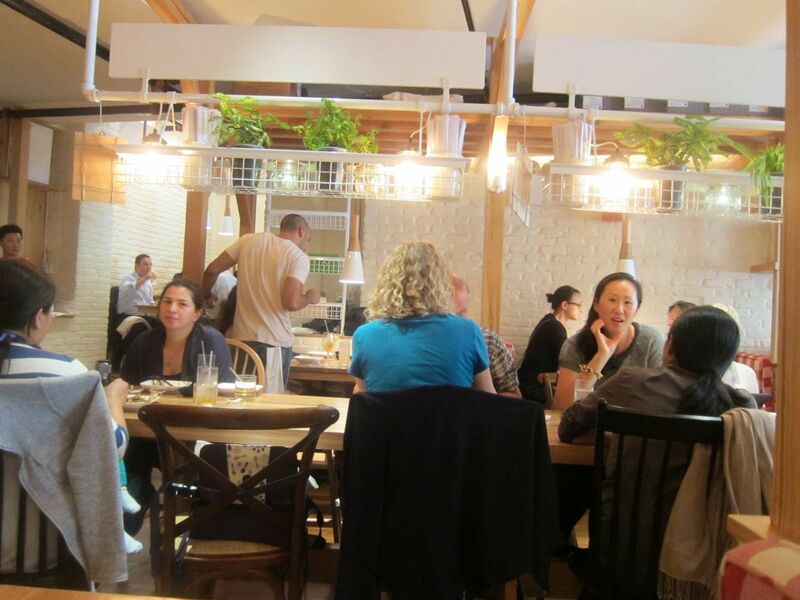 Still, starters and salads begin at $7, dim sum are $12 and $14. Two or three can can share wild rice noodles with barbecued duck breast for $27, rather than the $41 Creekstone rib steak. Typically inauthentic Chinese: Raw tuna cubes with tomato, salmon roe, and crisps. That first day I let the kitchen warm up for two hours before arriving with a friend, a downtown habitué who refused to wait a minute longer. It might have been the last time anyone would see an empty table at 2170 Broadway. We loved the not-exactly Cantonese chunks of raw tuna with tomato and the crisp shrimp and mango wontons, but thought the vegetable pies lacked pizzazz. 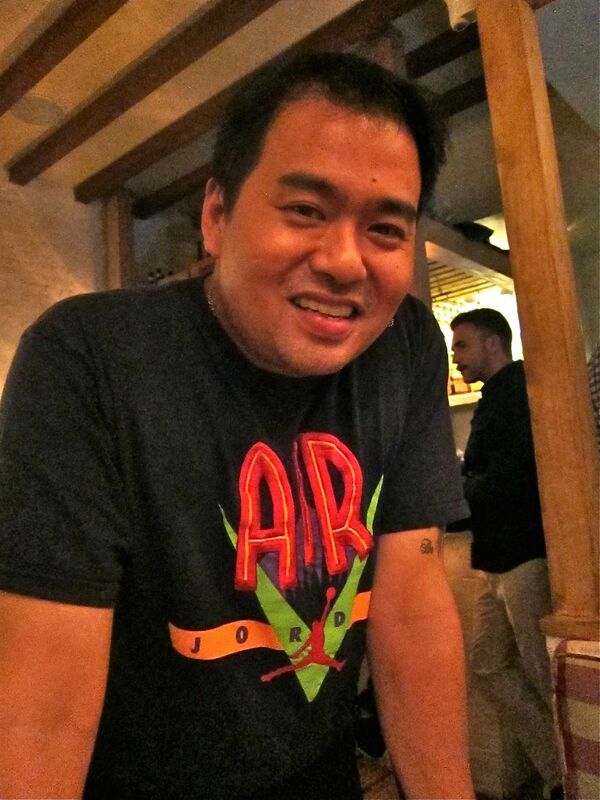 A new kitchen, a new staff, a new menu, Dim Sum Wizard Joe Ng does it his way. My friend liked the lobster and broccoli tempura better than I did. 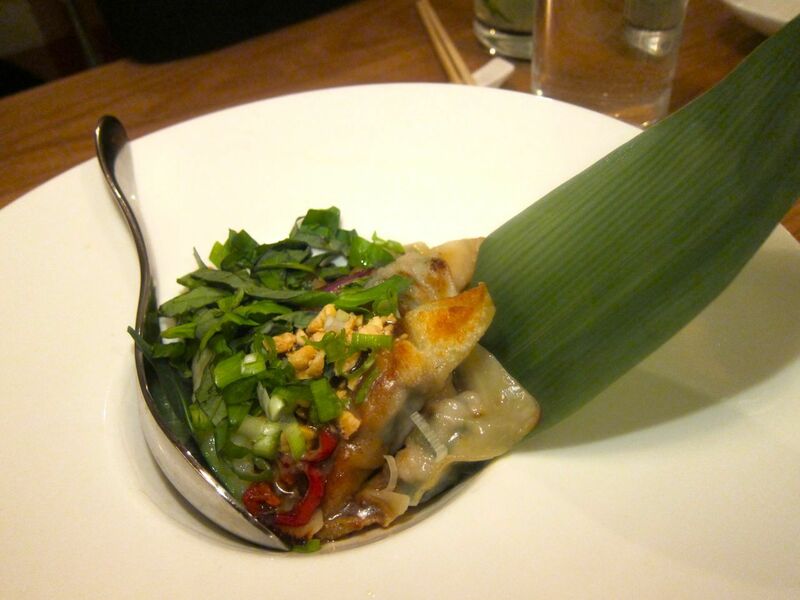 I begged to have the fabulous five flavor chicken dumplings smaller – two bites instead of the unmanageable four that slipped off my chopsticks gracelessly. I actually asked chef-partner Joe Ng myself. He smiled indulgently. 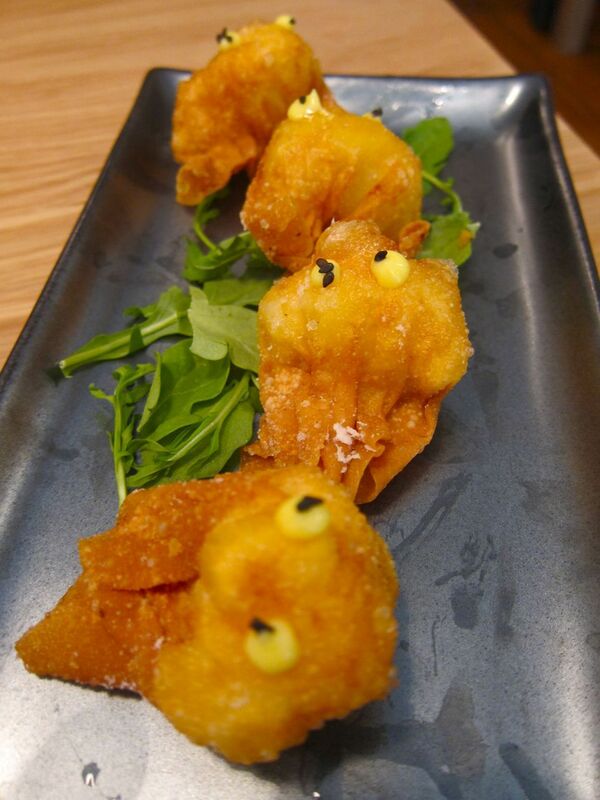 Crispy shrimp and mango wonton have fish tails and eyes. No, I wasn’t first in line for dinner at the door last Thursday. I gave them 24 hours to ride the frenzy. The next night at 7:00 the siege looked like Black Friday at the shopping mall. A hassle of Upper West Siders were crowded into the tight entry inside the door, with an overflow on the sidewalk. I slid into a few inches of space at the back and waved. A tallish woman with a clipboard took notes. A second woman bandied with the attendees. “Your table is ready,” the clipboard said, leaning over to catch my eye. I tried to make myself tiny and slithered by, hoping there was no armed psychotic offended by the concept that I had a table before her. Even a chopstick in the eye could stifle my career. A 30-year veteran of Chinese restaurants, Eddie Schoenfeld goes with the flow. 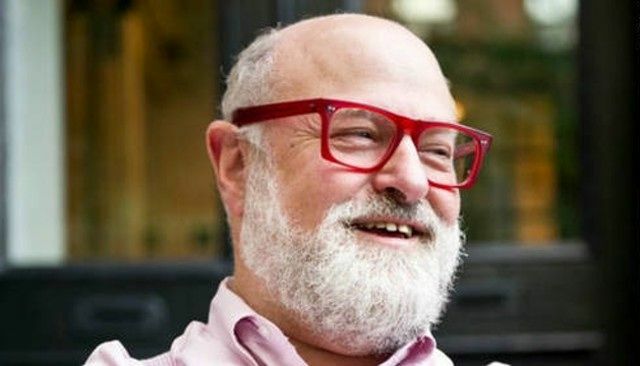 I could only hope the bristling bit-chompers might recall operating partner Ed Schoenfeld’s Orwellian confession: All customers are created equal, except some are more equal than others. I’ve known Ed since the 70s at Uncle Tai when he was the only Caucasian captain in a Chinese restaurant. I thought the veggie pie was too tame and it’s been fixed. I like this pork belly version. I settled into the front booth --- red and white checked like downtown, dishtowel napkins crisp and new. A thick of attendees hovered behind the fully-committed bar, pivoting, heads swiveling, laser-eyeing anyone inheriting seats ahead of them. I wondered if I would be safer looking like Gael Greene or not looking like me. I can’t eat a 5 flavor chicken dumpling gracefully (too big) but wow, what flavors. When my friends arrive, I lose myself in the menu and the specials list. My pals urge me to order. I think it’s wanton to focus on entrees here when Joe Ng, the dumpling master of the universe, is rolling out any of the 1000 tricks in his dim sum repertoire. 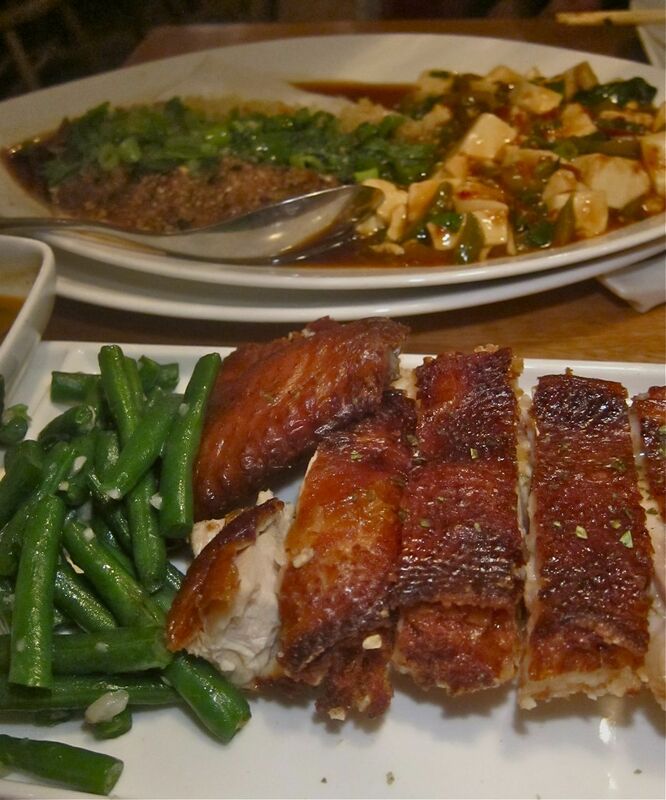 Normally I fill up on dumplings, and then sign off with the remarkable shrimp-stuffed chicken and/or a noodle dish. I invariably start with the smoked salmon bruschetta – curls of fish on a greaseless fried eggplant crisp. 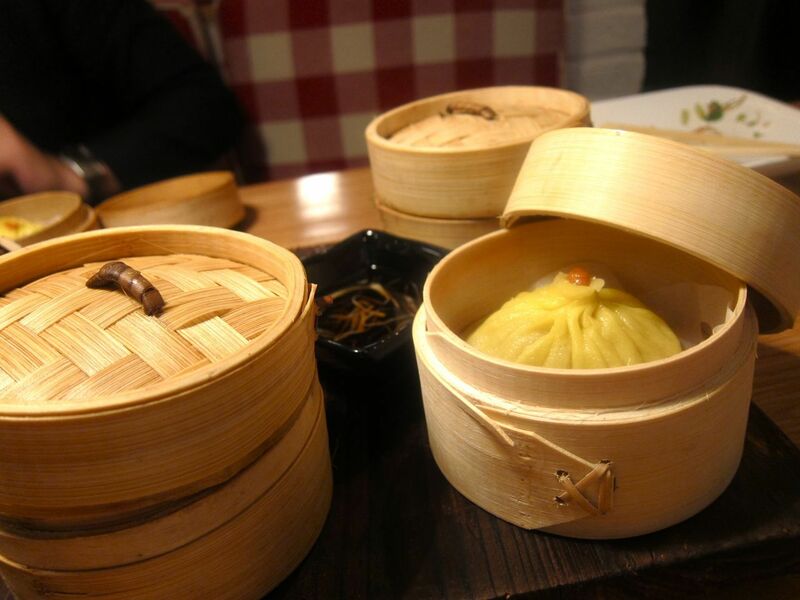 Luscious Shanghai soup buns served in small individual steamers seem sturdier. Then I focus on Ng classics: the shrimp and snow pea dumplings, the crunchy vegetable and peanut dim sum, and the Pac Man shrimp dumplings with a disc of shrimp toast to dip into guacamole. Joe’s Shanghai soup buns are lush with flavor – in winter they get a boost with fresh black truffles. For first-timers, I demonstrate how to slide the large bun onto a ceramic soup spoon without tearing the skin. I recommend sprinkling it with vinegar and a few strings of ginger and sucking out the mingled crab and pork juice. Half the time I manage to break my dumpling. If you’ve never had Katz’s pastrami egg roll downtown, you probably should. One is enough for two. 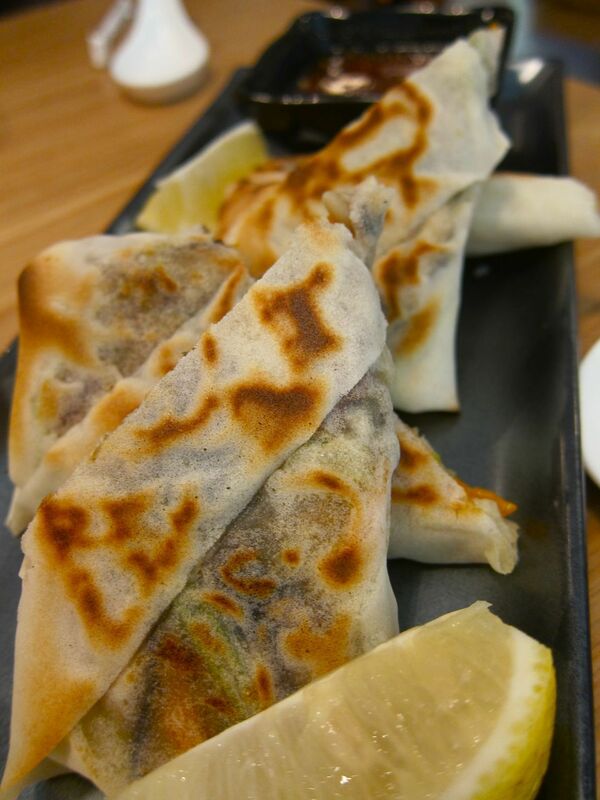 I also love the lamb pot stickers, caramelized on one side. But my friend Dorothy doesn’t eat red meat. I’m focusing on dishes we can all share. It’s easier than indulging a vegetarian. 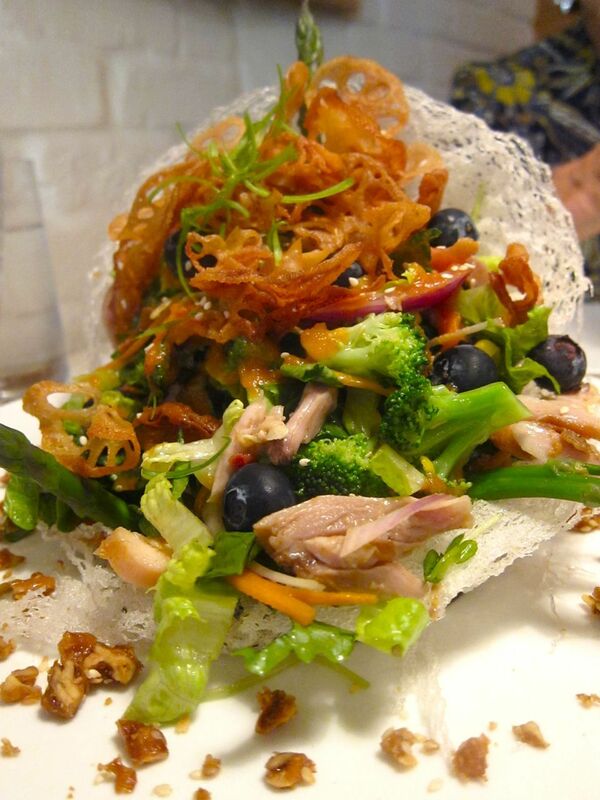 A run of dim sum and starters followed by Chinese chicken salad can be dinner for me. I’m here tonight to taste the lemongrass pork chop, new uptown. A friend has insisted it’s the star of the Broadway menu. But fate conspires. After all those dim sum and the Chinese chicken salad – a favorite of mine and of Dorothy too -- I spot the shrimp stuffed chicken among the specials. It cannot be ignored. And guess who’s finishing the last of several crusty cuts, topped with crackling skin? If only we were four or five and I’d eaten less. Since I first tasted the crusty shrimp-stuffed chicken I have to have it every time. None of us is smitten with the listless red snapper, a gift from the kitchen. 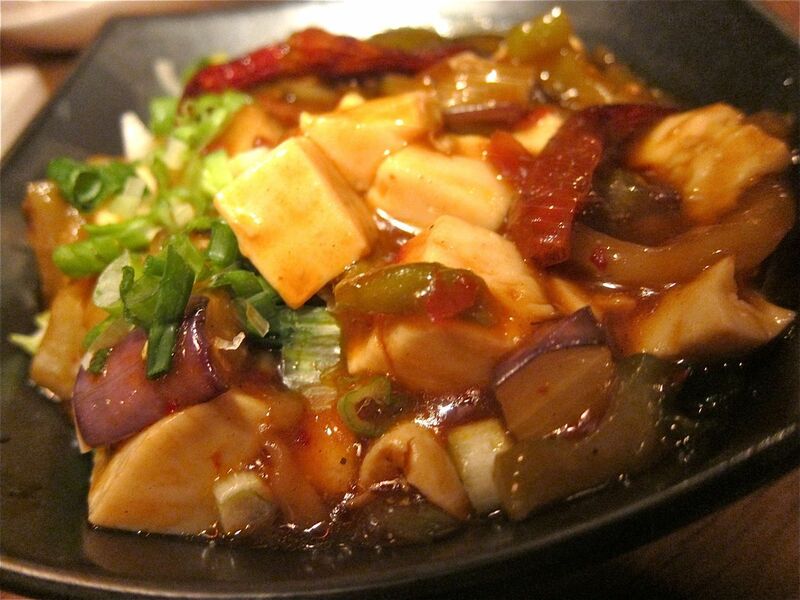 But it comes with marvelous vegetarian tofu, mildly kicky. Dorothy and I finish that too. My companions think we should cancel the pork chop. That’s crazy. That was my mission. But I’m feeling the excess and acquiesce. Then they order dessert. The red snapper is a snooze but its accompanying kicky vegetarian tofu is fine. I’ve had glorious fresh berries at Red Farm downtown, my favorite dessert. I like the idea of 76 percent cocoa chocolate pudding. But I don’t agree with our enthusiastic waiter who confides that the house key lime pie is legendary. It isn’t really. It’s just a pie. At some point, when the chef trains his crew to chug along on their own and catches up on his sleep, maybe he’ll find time to introduce some of his sweet dim sum. Bay scallop ceviche “cooked” in blood orange comes in the shell. 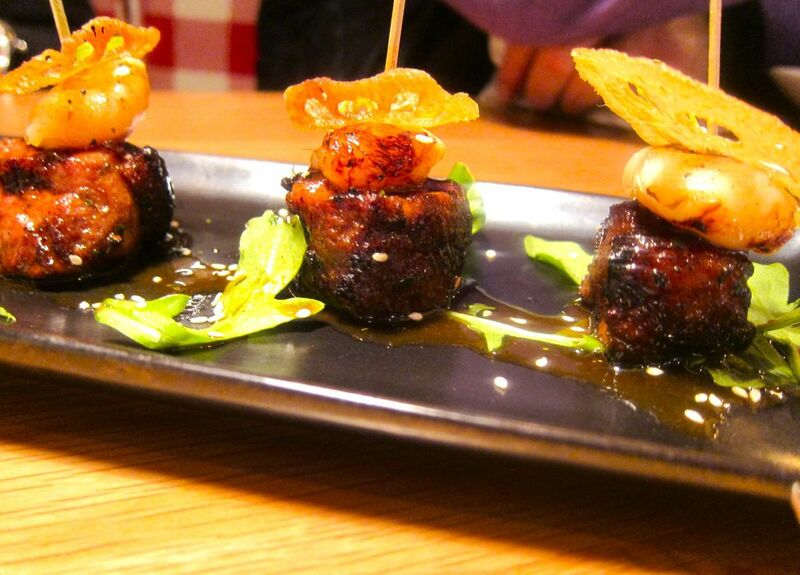 Grilled duck and litchi skewers topped with a lotus root chip are another discovery for me. 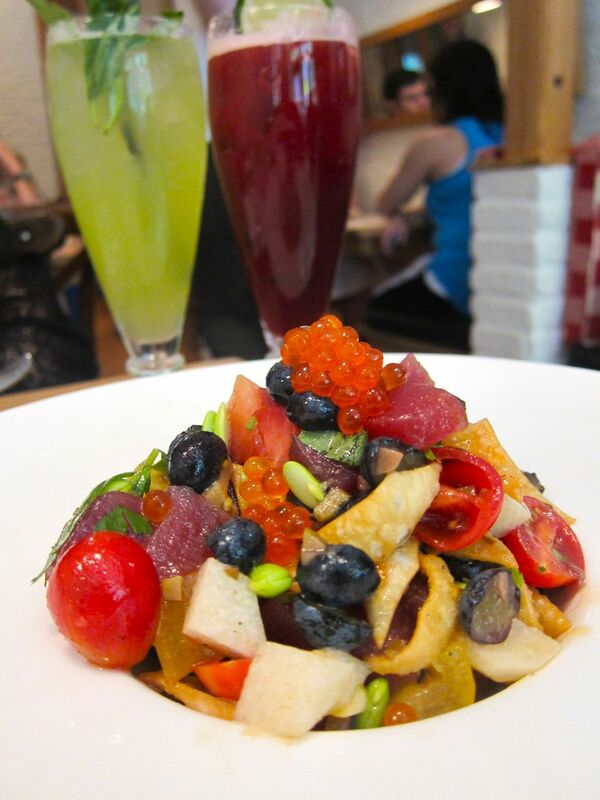 Eddie invented the new starter, a boldly refreshing raw tuna toss with tomato, soy beans and Chinese crisps. He pops back to taste it. The guys insist I share everything. 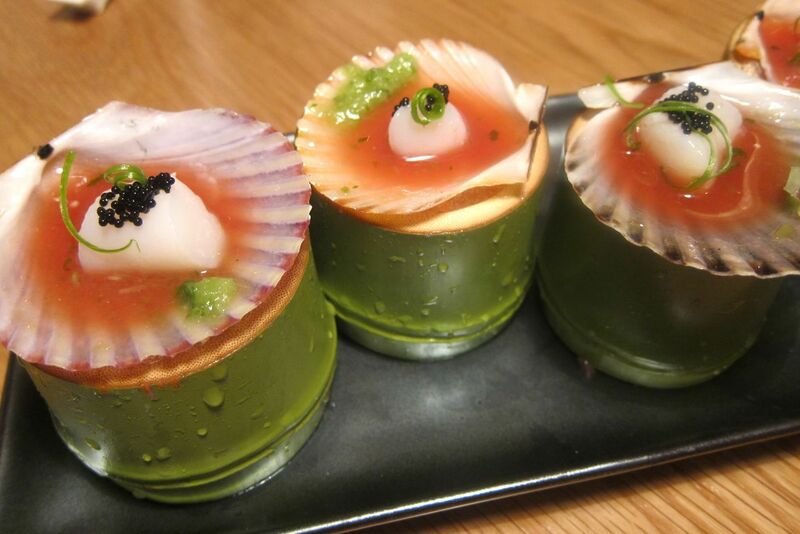 I rediscover the tangy citric tingle of blood orange scallop ceviche in the shell. 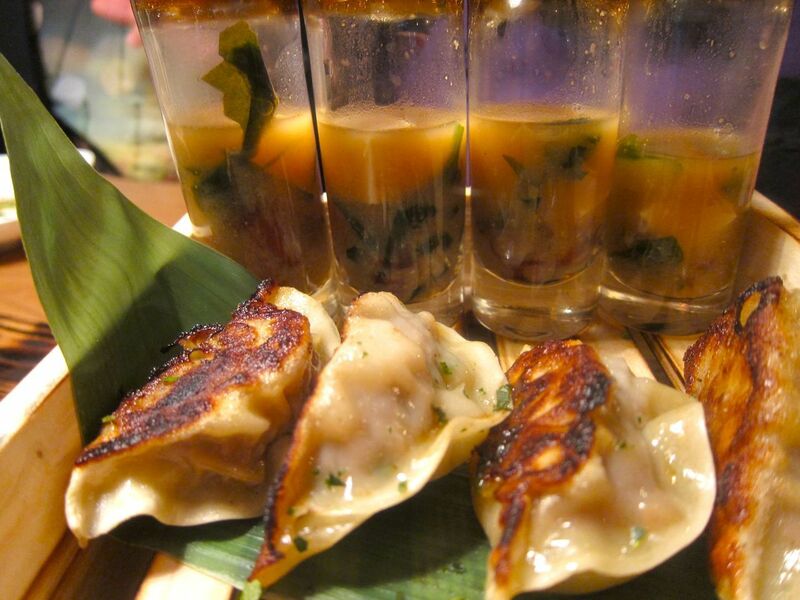 I’d never seen the lamb shooters before -- my favorite lamb potstickers with a seaweed miso tofu shooter to sip. How could I have missed out till now? Papaya-marinated skirt steak is grilled, then tossed with asparagus and leeks. 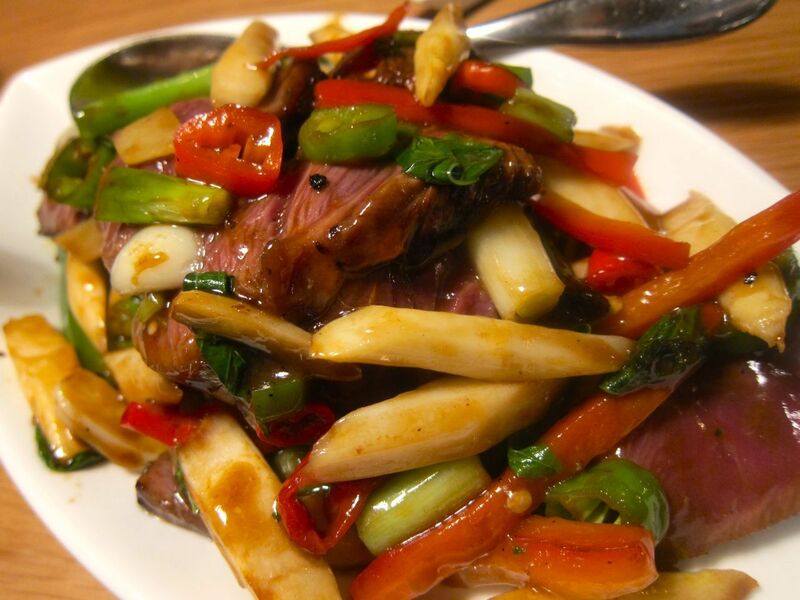 I don’t know another Chinese or somewhat Chinese kitchen delivering skirt steak like Chef Ng’s: Marinated in papaya and grilled, then tossed with Chinese vegetables and jalapeno. It’s like eating velvet. A bite of lamb potsticker, then a sip of the shooter. The pork chops, velvety too, live up to billing. Normally they carry shishitos as sidearms but with shishitos out of season, the plate is bristling with jalapeño. A little curl ignites my mouth. I crunch a cut of white asparagus to put out the heat, then taste a juicy ribbon of meat cut from the bone. The pork flavors a nest of Japanese short grain rice with its striking umami. Eddie croons with pleasure. He piles more rice on my plate. Chivalry reigns. They agree I shall take the leftover pork for my dinner. 2170 Broadway between 76 and 77th Streets, 212 724 9700. Open Monday through Thursday from 11 am to 11pm. Friday 11 to 11:45. Saturday 10 am until 11:45 pm. Sunday 10 am until 10:30 pm. Click here to follow my twitterings. And click here to see my vintage evening bags on Etsy.